If you have read the previous historical post on Olaf the White of Dublin, then you will already be aware that similarities in the Irish sources suggest that he may have been a brother of Ivarr the Boneless. This has been drawn mostly through similarities in names (Norse Ivarr and gaelic Imar) as well as a few key events from these sources and Anglo-saxon sources which coincide. I don’t really want to rehash over the evidence in the Irish annals here as I think there is enough information in the previous post. So if you are interested in the possible Irish link between Olaf and Ivarr, I suggest you take a look here… and find yourself a coffee and a comfortable seat, it’s longer than the average post. Not only is Ivarr linked with Olaf the White but he seems to be linked with several key people during the 9th century, both real and imagined. It is hard with any historical figure from any time period to decipher the real person from the legend, but we shall see how far we can go with Ivarr before I lose everyone. Ready? I have decided to start with the English sources as they are the most straight forward when talking about events surrounding Ivarr, as well as having several events which coincide with known fact. In short they seem the most accurate and most logical. For Ivarr’s activities within England, we have as a reference the Anglo Saxon Chronicle, The Chronicle of Florence of Worcester, Flores Historiarum by Roger of Wendover, and two sources by Simeon of Durham (History of the Church of Durham, History of the Kings). This group then ride their newly acquired steeds and sail their ships north to the land of the Northumbrians who then over the course of four months, capture York and kill that kingdom’s kings and leading earls, as well as ravaging the land as far as the Tyne river. The next year, 867/8, the Danish army is recorded as being encamped at Nottingham in Mercia. We are told that Burghred the Mercian king calls on his brother’s in law in Wessex to help drive out the Danes, however we are not told specifically who the Danish leaders were. Whether it was the whole army, led by Ivarr? Or whether it was only part of the army, perhaps led by one of the other leaders mentioned previously? In 870 however, Ivarr is clearly mentioned with one of his brother’s, Ubba, when they take their armies into East Anglia, and that Ivarr ‘the most cruel of all their dukes’ was the leader. They create their winter quarters at Thetford and by November they had killed King Edmund and presumably installed a puppet king in his place as they had at York. The last mention of a viking leader called Ivarr comes from Simeon of Durham’s The History of the Kings, and from the Anglo Saxon Chronicle. Simeon says that both Ivarr and Halfdan were killed off of the coast of Devonshire, along with 23 of their ships in 878. The Anglo Saxon Chronicle however gives a slightly different version of events, suggesting that Simeon may have made a typo. The ASC states that it was the BROTHER of Ivarr and Halfdan who went down with the fleet, though which brother this alludes to is unknown. In the Annals of Ulster and the fragmentary annals of Ireland, there is an Imar mentioned who is associated with his brothers Amlaib and Ausile (for more information read the HFP: Olaf the White). The adventures of these brothers in Ireland are many, however there is never any mention that this particular Imar (which can be translated to Ivarr), ever went to Northumbria… or anywhere in England. He did travel with Olaf the White to Strathclyde and helped siege the stronghold of Dumbarton, but that was the closest this particular character ever came to ‘England’. So is this Imar the same Ivarr as Ivarr the Boneless who attacked Northumbria? In 873, an entry from the Irish Annals record that the Irish Imar, ‘… King of the Norsemen of all Ireland and Britain ended his life.’ There is of course the possibility that this includes the area captured in England (Northumbria, East Anglia and parts of Mercia). However, it could also mean Britain in the original sense of the Britons, i.e. the Strathclyde Britons, which we know were defeated by Olaf and the Irish Ivarr in 870. Ivarr, don’t forget, would have been a very popular name so there is no definite way of linking these men on shared names alone. Without corroborating evidence, they are simply two Ivarr’s from the same time period. The Sagas are well known both for their exciting tales of kings descended from gods and the deeds of heroes and heroines. The history of Scandinavia and other countries within these tales are so twisted up in fantasy and mythology that it is often hard to decipher what is true and what isn’t. The fact that these histories were handed down by word of mouth and not written down until the 13th centuries onwards, means that they have to be studied carefully, and with a pinch of salt (as the old saying goes). Ragnar comes to claim Sweden and Denmark as his own after the death of his father, King Ring. He marries his first wife, Thora who gives him two sons. Eirik and Agnar. 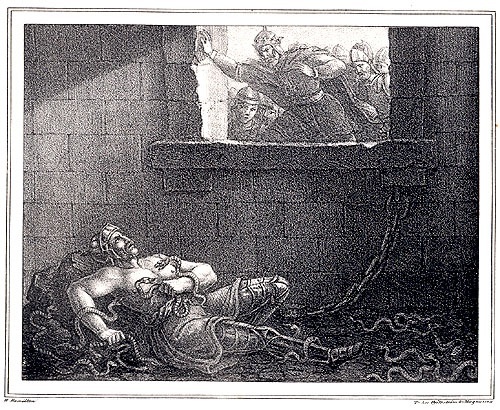 Thora dies soon after the children’s birth and Ragnar marries Aslaug (also known as Randalin). She gives Ragnar four children. Ivarr the Boneless, Bjorn Ironside, Hvitsek, and Sigurd Snake-in-eye. Ivar is known to be a very clever man, and when he becomes older, he, along with his brothers and elder half-brothers, conquer Zealand, Reidgotaland, Gotland, and Oland and other smaller islands. Ivarr then sets himself up at Lejre in Zealand with his younger brothers. Ragnar is angered that his sons did this, as it was against his wishes to make war within the kingdom whilst he was away. He makes Eystein Beli King over Upper Sweden so as to guard that land from his sons. The two elder sons, Eirik and Agnar, then join in battle with Eystein after failed negotiations for an alliance against their father Ragnar, resulting in their deaths. In retribution, Aslaug, along with her sons Ivar, Hvitserk and Sigurd, all go to Sweden to attack Eystein and his lands. Ragnar, who is away campaigning, hears of Eyestein’s death and his family’s part in it all and is once again angry that they acted without him. In an attempt to show he is more famous and more successful at battle and raiding than his troublesome sons, he goes to England and attacks that land. This of course backfires on poor Ragnar Lodbrok, as this then leads to his eventual death at the hands of King Aelle of Northumbria after being thrown by him into a pit of vipers. According to this particular story, the remaining brothers then come over to England to avenge his death, but upon seeing the immense English army that meets them, and the reluctance of Ivarr the Boneless and his men to fight, Hvitserk and Sigurd lead their armies away. Only Ivarr stays in England and makes his way to the king’s court with a crafty plan. He asks King Aelle that if he would give him a cow hide, and the amount of land that this cow hide could cover, then he would leave England in peace and never again would he or his brothers attack. King Aelle is taken by the trick and agrees. Ivarr then takes the cow hide and stretches it so thin, that it takes up the entirety of York. During his stay in the king’s court he also makes his own friends and alliances with the high-ranking men of York. He then sends a secret message to his brothers to come and attack. The brothers attack, Ivarr’s new friends in York change sides, and Aelle is tricked by Ivarr’s false friendship. The blood eagle is carried out on his back and he dies a bloody and painful death. Ivarr is made king of Northumbria (which apparently previously belonged to his Danish forefathers.). Two of his brothers which had been born out of wedlock, named Yngvar and Husto, take their armies into East Anglia and kill King Edmund on Ivarr’s orders (an interesting twist on the ASC version). According to this particular Saga, Ivarr the boneless was king in England for a long time thereafter. He had no children as he had ‘no love or lust’, and he wasn’t short of cunning and cruelty. He died of old age and was buried in England. After Ivarr, Adalmund, the son of St Edmund’s brother, took the kingship in England and converted large parts of it to Christianity. He took triubute from Northumbria, because that was heathen. His son Adalbrigt ruled after him. Of course, there are some very small coincidences between the Tale of Ragnar’s Sons and what we know from English sources, however most is obviously elaboration. 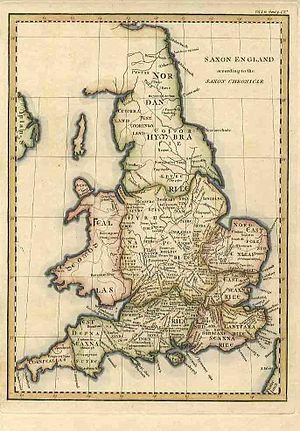 Adalmund, for example, is not mentioned in any of the aforementioned English sources, and the kingdoms which made up ‘England’ at the time had been Christian for at least 100 years or more, especially Northumbria (perhaps the tale is alluding to the later rule and conversion of parts of East Anglia as part of the Danelaw?). As for any one man being king over all of England, that did not happen until Alfred the Great’s grandson, Aethelstan, in 927, over 60 years later. The Gesta Danorum by Saxo Grammaticus provides an embellished version of the previous events. In this version, Ladgerda was Ragnar’s first wife and Thora his second. By Ladgerda he had two unnamed daughters and a son called Fridleif. By Thora he had Siward Snake Eye (Sigurd), Biorn (Ironsides), Agnar and Iwar (Ivarr). Hwitserk and Eirik from the previous tale are here sons of his third wife Swanloga, and a child called Ubbe was born out of wedlock to an unnamed woman. After the death of his second wife to illness, Ragnar tried to preoccupy his grief with warfare. He attacked England and killed many, amongst them was a king called Hame who was apparently the father of Aelle (there are no records of their ever being a King of Northumbria being called Hame). Many years passed of warfare after warfare and several treacheries by his sons. Iwar/Ivarr, was ruler of Jutland and seems to have stayed out of the troubles, which eventually earned him his father’s love and gratitude. At one point he even rules his father’s kingdom while Ragnar is absent in Russia. Once again, Ragnar eventually winds up on the shores of Northumbria, is killed in a pit of Vipers by King Aelle, and on hearing of their father’s death, Ivarr and his brother’s come to Northumbria to seek their revenge. Seeing that his own forces would be outnumbered, Ivarr tricks Aelle into giving him land (this time as much as a horse’s hide could cover, not a cow’s), on which he founds the city of York (obviously a generous embellishment). Ivarr’s brothers, Siward and Biorn (not Halfdan and Ubbe as in English sources), come to York with 400 ships and the City is captured. King Aelle is killed. Ivarr is then made King of England (York) for two years, after which the tale says that he joined his brothers fighting in and around Denmark, where he later settled. His brother Agnar is made King of England (York) in his place, yet from this time on there is no other mention of Ivarr or his eventual death. SO HOW DO WE MAKE SENSE OF ANY OF THIS? As I said before, with a pinch of salt. From my own point of view, I am more inclined to believe the English sources, especially the Anglo Saxon Chronicles. Not only have they proven to be right about most other events, but they seem to deal more with the known facts instead of getting carried away with rumours and legends. In saying that however, we don’t need to completely disregard the Irish and Scandinavian sources either. In November 870 (which according to the Anglo Saxon way of recording the new year, was really November 869), Ivarr and Ubba were in East Anglia. They killed King Edmund, which is the last definite date for which Ivarr is known to have been in England. Chronologically, if we then merge the English sources with those of the Irish, it is possible for him to then cross the country to meet Olaf in Dumbarton, leaving the running of York and the raiding in England to his brothers Halfdan and Ubba. This would also fit in very loosely with the Gesta Danorum, which says that Ivarr was ‘ruling England’ for two years (the very end of 866 until end of 869), and then passing his rule over to his brother Agnar (Halfdan?). Of course we don’t know that Ivarr did this, however it is very tempting when Ivarr the Boneless disappears from all English records in 869/870 while another Imar pops up in Strathclyde, just over the border from Northumbria. As for the Scandinavian sources, it is obvious that most of what is said is pure fiction, yet a lot of the names and later events have a ring of truth. Many of Ragnar’s sons, Ivarr himself as well as Sigurd the mighty, and Ubba are names of real men which pop up in the English sources as well, and i am also still intrigued by the link of Olaf the White to Ragnar Lodbrok. I also think that the tales of constant fighting and upheaval between rival families and within Ragnar’s own family are symbolic of the troubles within Denmark and Norway at the time, which no doubt contributed to the Vikings leaving their lands. What we do know for certain is that Ivarr, his brothers, and the men and women who came from across the seas and harassed the western Isles, changed England irrevocably. So much so, that we are still talking about them over a thousand years later. For those interested in Ivarr’s nickname, the boneless, this documentary gives a very interesting explanation. 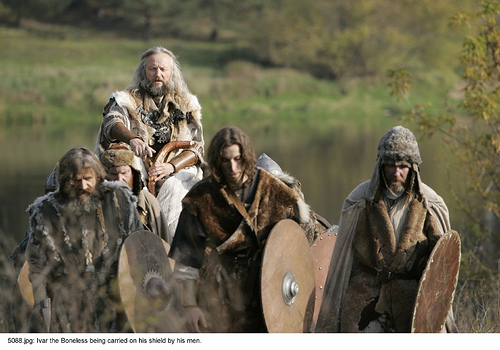 I would like very much to know where one of your images comes from, the film still or photo (JPG 5068 or 5088) of Ivarr the Boneless being carried on his shield. Is it from the Discovery Civilization documentary embedded in the page or from another source? I’m doing some research for my own scholarship and would like to track down the source. Thanks. Much appreciated. It’s a start. Reblogged this on Djalma Blog. Ivar the boneless may have had fibular hemimelia, like Oscar Pistorius and several other paraolympians. One of the most convinving theories on his name I heard is that it is just a miss-translation from Latin. None of the older Scandinavian sources use the name “boneless”, only the later ones. Adam von Bremen called him “crudelissimus”, the extremely cruel. A synonym for crudelissimus is exosus. Someone who is familiar with Latin but not fluent, could easily interpret “exosus” as “without bones” or “without legs”. This found its way back into Scandinavian literature, where it was translated as “beinlausi”. Fascinating. Thank you. I will make a note of it when the subject comes up in my course on Old Norse Literature. Thanks Tom. I have to agree that sounds pretty plausible. Will have to read in to that a bit.